Terry Bluford Moore (May 27, 1912 – March 29, 1995) was a Major League Baseball center fielder. He played for the St. Louis Cardinals from 1935–42 and 1946–48. A right-handed batter and thrower, Moore began his professional baseball career in 1932. In 1934, he hit .328 in the American Association and earned a roster spot with the Cardinals the following season. 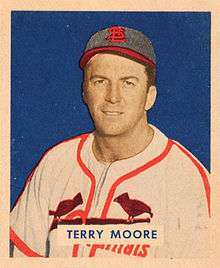 Moore joined the Cardinals the year after the Gashouse Gang won the 1934 World Series. He hit for a career .280 batting average in 1,298 games, with 80 home runs. He played on two National League championship and world champion teams: the 1942 and 1946 Cardinals. During his career (interrupted by World War II service), he played with greats such as Dizzy Dean, Joe Medwick, Frankie Frisch, Johnny Mize, Enos Slaughter, and Stan Musial — all members of the Baseball Hall of Fame. However, Moore was the captain of those Cardinals teams. Moore was also known for being a great center fielder, who would have won several Gold Gloves had the award been available. He was an All-Star for four straight seasons, from 1939 to 1942. 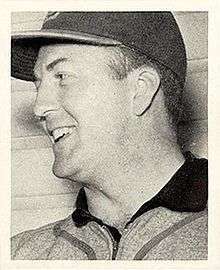 When his playing days ended, Moore served two terms (1949–52; 1956–58) as a Cardinals coach. He also managed the Philadelphia Phillies in 1954. After beginning the 1954 season as a Phillies scout, he replaced Steve O'Neill as the club's manager on July 15. He managed the Phils for exactly half a season — 77 games — and the team won 35 of those games (for a winning percentage of .455). ↑ The Virtual 1946-1949 St. Louis Cardinals (Part 1). The Hardball Times. Retrieved 2010-10-10.